Mold TownThe busy market town of Mold is located 10 miles west of the border with England. The town is home to Clwyd Theatre Cymru, Wales' major drama house, originally built as a Regional Arts Centre. The Theatre hosts a variety of drama, dance, music and a community festival in Summer. There are around 1,500 public performances a year. 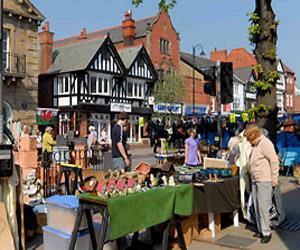 The busy market town of Mold is located 10 miles west of the border with England. There are two country parks within a few miles of the town. Moel Famau Country Park is named after the mountain Moel Famau which, at 1,818 feet above sea level, rewards you with outstanding scenic views. The park incorporates over 2,000 acres of the Clwydian Hills and has Bronze Age burial mounds, ancient standing stones and the remains of three Iron Age hill forts. Loggerheads Country Park offers 67 acres of wonderful parkland with walks and nature trails, there is also a working corn mill and a Visitor Information Centre and a café. A55 Junction 33B & A494 to Mold.